Why Do Squirrels Lose Their Hair? Squirrels are a common sight in urban and suburban areas; many generations of squirrels have adapted to living alongside humans. Occasionally, you'll see a squirrel who is missing hair from his tail or body; parasites, fungi and traumatic encounters are the most common cause for this. Among the 279 or so squirrel species, those best adapted to living alongside humans include Eastern (Sciurus carolinensis) and Western grey squirrels (Sciurus griseus). In addition to living in their historic range that includes North America east of the Mississippi River, Eastern grey squirrels have been introduced to the western United States and Europe. These squirrels are 14 to 21 inches long and are skilled at climbing, jumping and foraging. The historic diet of squirrels includes nuts, acorns, seeds, flowers, fruit and the occasional insect or lizard; for modern squirrels living in cities, human refuse and crumbs are important food sources. Squirrels usually give birth twice per year, and each litter contains two to four babies. Maximum life span in the wild is a little more than a decade, but in captivity squirrels can live for twice as long. Two types of mange are well-known; small skin mites cause both forms. One type of mite causes sarcoptic mange, which is most common in dogs, coyotes and foxes. A different species of mite causes notoedric mange, which -- unlike sarcoptic mange -- appears to be host-specific and only affects squirrels. Squirrels transmit these mites to and from each other by direct contact and by using shared nests. Though the patches of hair loss can cause a few weak squirrels to die from exposure, most cope with the condition and eventually recover. Mild winters and high squirrel population density often lead to mite outbreaks. Superficial fungal infections cause hair loss in some squirrels, and it is most common in abnormally wet years. Termed dermatophytoses, they cause the hair of afflicted squirrels to break off right at the skin. This gives the squirrels a stubbly look in some patches while the hair grows back. Fungal infections are rarely fatal for squirrels, as their immune systems generally fight off the infection over time. Squirrels are susceptible to ticks and fleas like most other mammals. This is particularly true of squirrels living in urban areas with numerous feral dogs and cats. Though it is rare, these parasites can cause the animals to lose their hair. As with other parasites, high population density and mild winters increase the prevalence of the ectoparasites. 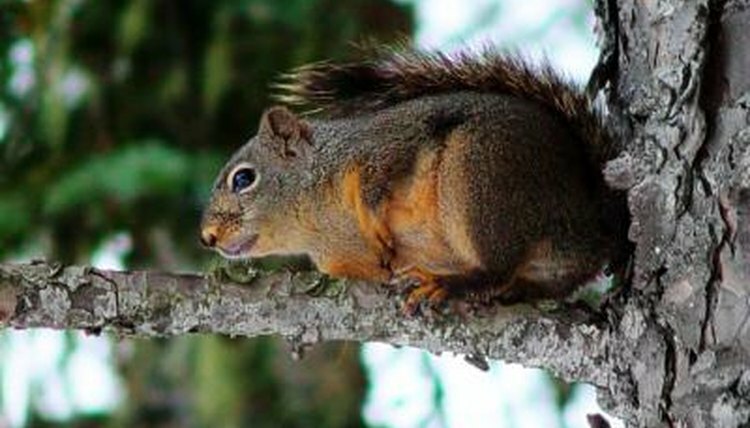 Most squirrels survive flea and tick infestations. Squirrels must avoid a variety of predators and dangers as they navigate the suburban and urban landscape. Cats, dogs, hawks, snakes, foxes and coyotes all prey on squirrels. Sometimes, the squirrels are injured in these encounters, losing some of their fur or skin in the process. Usually, traumatic events leave other marks like cuts, scrapes or bruises. Veterinarians and wildlife biologists do not recommend treatment for squirrels who have lost their hair. The causes for many of these problems are completely natural, part of the cycle of life. Even were a veterinarian to recommend treating a squirrel, because of the communal use of nests and frequent contact with other squirrels, reinfection would likely occur. Purdue University: Everything Wildlife: Hairless Squirrels? Why Do Squirrels Roll Around? What Time of the Year Do Squirrels Come Out? How Old Is a Squirrel When It Opens Its Eyes and Grows Hair? How Do Squirrels Hang Upside Down on Trees?